Rustic, modern, classic, Scandinavian… we really have a world of options available when it comes to choosing design styles, both for exterior facades and interior spaces. And at the risk of sounding like we’re picking favourites, here on homify we do have a soft spot for the Asian style, which is exactly why today’s homify 360° discovery is so extra beautiful to us. 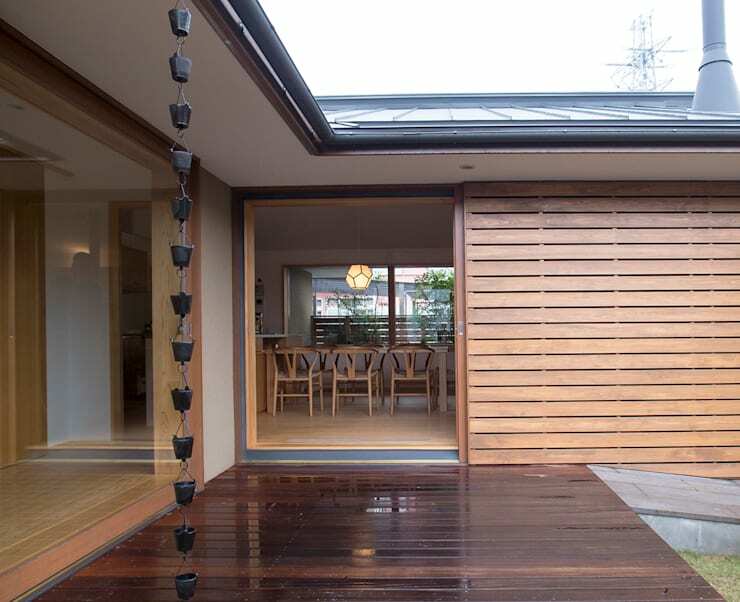 When imagining the typical Japanese building style, one often sees open floors, wooden surfaces, sliding doors, pale colours, and a minimum amount of furniture. 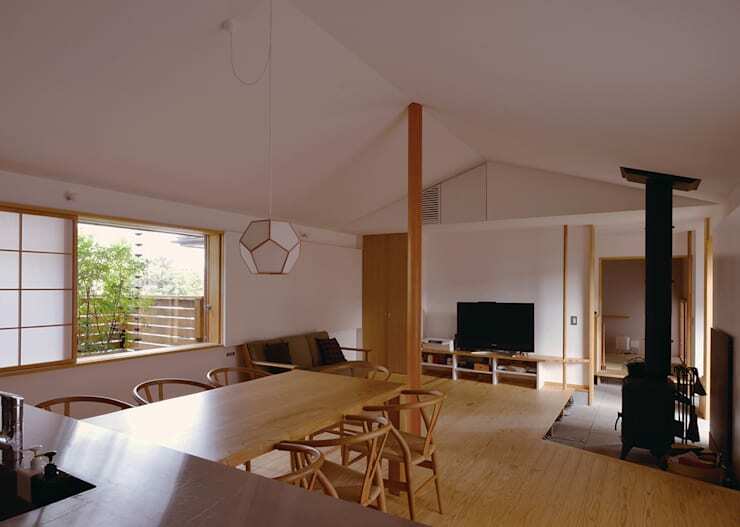 And although it would be quite unfair to pigeonhole all Japanese and Asian houses into this specific look, today’s house does, in fact, feature all of these. What a modest little beauty. Although the facade is very much inspired by the Asian design style, it does feature a lot of modern touches too. Grey slated roof, light beige concrete, and dusty toned timber all come together to make up a colour palette that is most tranquil and soft, immediately putting our minds at ease – what a great way to welcome a visitor to your front door, don’t you agree? If we thought that the exterior facade was light, we get a stylish reality check once we enter the insides of the house. White walls and pale grey floors are made even lighter thanks to the incoming sunshine from the generous amount of glass doors and windows. To offset these whites and greys, a touch of caramel timber can be found around every corner, visually warming up the interiors. 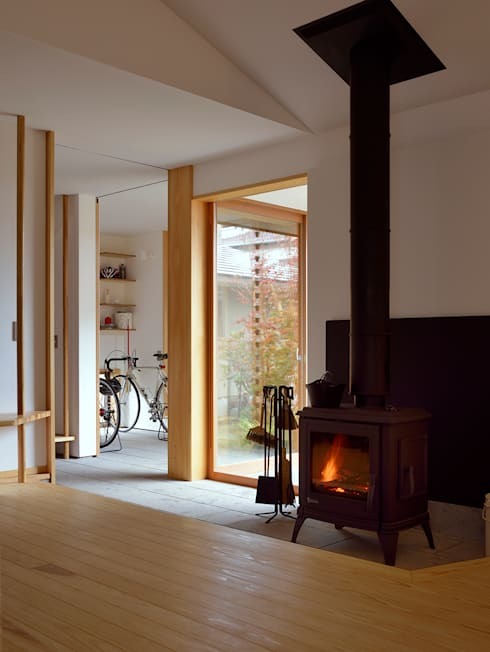 Speaking of warming up, we are delighted to discover a modest little wood-burning stove, stylishly inserting a touch of jet-black into the light interiors. The oven is located at a prime spot – right in front of the timber floor, where the owners can have a comfy sit-down on a plush pillow to feel the relaxing warmth of their fireplace, while also catching a glimpse of their garden/courtyard through the glass door(s). 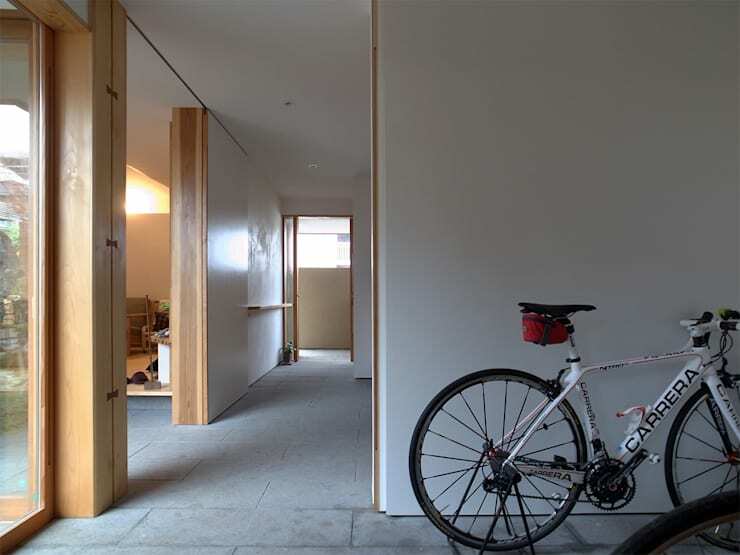 To save up on space, interior walls were kept to a minimum, meaning the majority of the inside spaces are laid out in an open-plan format. Here we can see the kitchen, dining spot, and living room all neatly integrated with each other. That light wood continues to adorn the surfaces, visually enhancing the spaciousness of the interiors. In addition, very little furniture and decorative pieces have been used, making the house seem much bigger than it actually is. Inspired by the Asian-style homes? We’re sure one of our expert architects here on homify can help you achieve the same for your own house. 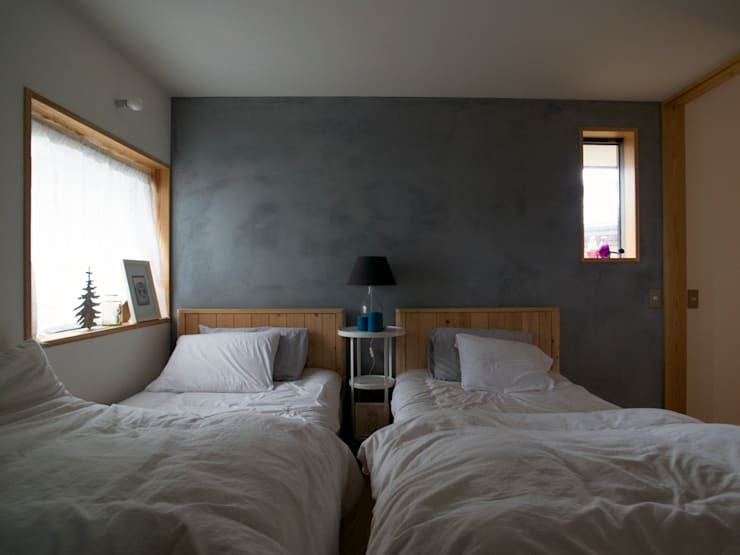 Beautifully continuing the ‘less is more’ look, the bedroom offers up the bare minimum: beds, lighting, and windows. A touch of grey is introduced here, making for a beautiful canvas against which the whites and woods stand out beautifully. A hop and a skip from the dining table, right through the sliding door, and we’re on a wooden deck (darkly coloured to contrast most effectively with its surroundings), offering us a prime spot to enjoy the garden. This deck is also the perfect venue for a number of activities: bring out a table with some chairs, and we can enjoy some al fresco dining; move out a couple of plush pillows, and it forms the perfect spot to lay down and get lost in a book; or grab that yoga mat and let’s do some meditating while taking in the quiet surroundings and peaceful ambience of this modest yet gorgeous little home. 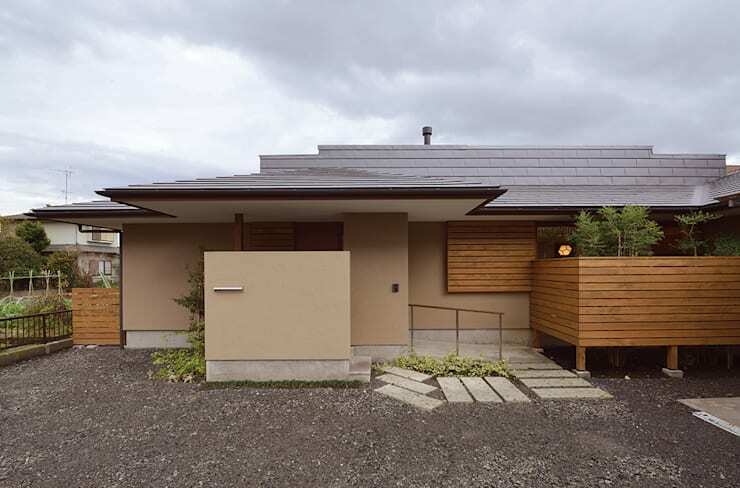 Seeking more Japanese-style homes? Then you’ll be crazy about: A Refreshingly Simple House.